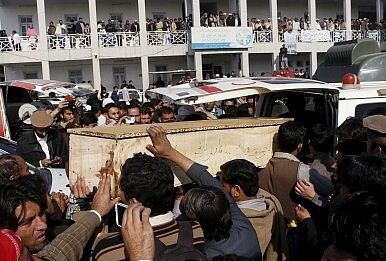 Relatives and friends surround the coffin of a student who was killed in the January 20 attack at Bacha Khan University. The winter cold might have called for less of a melancholy in Charsadda, on the morning of Wednesday, January 20, had some young militants not used the cover of thick fog to scale the rear walls of Bacha Khan University and then kill 22 people, according to government reports. The attack was symbolic in many ways, especially given that it targeted a role model of Pashtun identity. Historically, Pashtun populations have been marginalized by the Pakistani state; recently, they have been a consistent target of the Taliban. On the day of 148 funerals in 2014 in Peshawar, when the nation was in shock after the school attack, Prime Minister Nawaz Sharif led an All Party Conference, calling political allies and opponents across the board to gather around one table to develop a consensus for moving forward in the country’s struggle against terror. Eventually, these leaders agreed to a 20 point National Action Plan. The focus was counterterrorism, but the plan was ultimately a list of hastily assembled bullet points with no detail and no deadline. Apart from the ongoing Operation Zarb-e-Azb, which was launched in June 2014, which only focused on the northwest frontier along Afghanistan and the Federally Administered Tribal Areas (FATA), there has been no clear strategy on dealing with terrorists who escape across the border, including members of the Pakistani and Afghan Taliban and the leadership of the Haqqani network. One year later, Pakistani authorities claim to have conducted thousands of operations, taking huge numbers of suspected militants into custody, but what is the result when the country continues to face atrocities like the BKU attack? The 37-year-old mastermind of 2014’s Peshawar attack and last week’s attack at BKU, Umar Mansoor—a Tehreek-e-Taliban Pakistan (TTP) operative—can still call the shots, allegedly from Afghanistan. The TTP has publicly denied endorsing and staging the attack. Despite the ongoing military operations, the consistency of high profile attacks, even if they’re against so-called “soft” targets, reflects the perseverance of terrorism in Pakistan. To make this fight work, the civilian government and the country agreed that the military was to be empowered. After the Peshawar attack, the NAP resulted in widespread public support for the military establishment and its operations against militants. Songs of revenge and patriotism were sung by children across the country, who mocked the Taliban for being cowards. A monument was built on the campus of Peshawar’s Army Public School, where the children were slaughtered in December 2014, honoring their memory. Amid this effort at national recovery, one little detail was missed: The parents of survivors and victims of the attack, many of whom still struggle with the trauma over a year later, were denied compensation. Rest assured, the nation’s trust in the military was largely restored with the help of social media and the Internet, which seemed committed to cover the landmark success of Operation Zarb-e-Azb. The Inter-Services Public Relations (ISPR) agency, the Pakistani military’s outreach arm, has, however, not furnished the names of any captured or killed terrorists. And, of course, it goes without saying that none of the terrorists killed so far have been part of the senior leadership of organizations like the TTP or the Haqqani Network. According to a Gallup poll from August 2015, 82 percent of Pakistanis believed that Operation Zarb-e-Azb was yielding positive results. The Peshawar attack, which took place at a private army-run school, gave a certain legitimacy to the military’s actions and plans. Ever since then, the Pakistani military establishment’s involvement in state affairs, be it through supervising the implementation of the NAP or expanding its operation in the southern port city of Karachi, has deepened, making the democratically elected civilian government nervous. This seemed sensible in theory, but what happened after all this effort by the military? Last week’s attack at BKU and the Pathankot attacks in India. In the face of these challenges, Pakistan’s defense minister has suggested that he needs more time to make the NAP work. Many Pashtun party leaders are more vocal than other politicians, partly because they have been marginalized — they have no choice, and little to lose. The grandson of Bacha Khan himself and chief of the Awami National Party, Asfandyar Khan, has emerged at the frontline of this discussion. Khan and his allies emphasize that the conversation must spread to Punjab. Asfandyar Khan received several calls of condolence after the attack. One was from Prime Minister Nawaz Sharif himself, who promised to “crush terrorism” yet again. Later in the day, he received a call from former Afghan President Hamid Karzai and the incumbent Afghan President Ashraf Ghani’s assistant. Both Afghan leaders expressed solidarity with the victims, in the spirit of Pashtun unity. This was perhaps intended to remind Asfandyar Khan that in these troubled times the Afghans are by their side, as Pashtun brothers. Bacha Khan’s family and followers have enjoyed a long friendship with Afghans and Indians. The two countries have often provided shelter to Pashtun leaders during their time in exile from Pakistan. These historic ties have also allowed a balance of power for the Pashtuns, who might otherwise have ended up cornered like Pakistan’s Baloch minority. Asfandyar Khan, whose party members have been a constant target of the Taliban, especially before elections, lashed out in a TV interview at the state’s failures in securing the landmark university, despite check-posts and security forces in the surrounding areas. “Were the security agencies sleeping?” he asked. He also suggested that the root causes of terrorism in the country are still being ignored. Back in Charsadda, his son Aimal Wali told a news channel that supporters of terrorism in Punjab need to be searched. Punjab could well be a farmyard for terrorist groups in the country. The eastern province, which borders India, has seen the spread of radical and extremist religious doctrine over the past few decades. Analysts have said that the region is a potentially major breeding ground for terror groups; anti-India and anti-U.S. groups like Jaish-e-Mohammed, Lashkar-e-Taiba, and Lashkar-e-Jhangvi are active here. Above all, Punjab has yet to receive serious attention under National Action Plan. This oversight is yet more evidence that Pakistani state is simply not serious about addressing the underlying causes of terrorism.